There are 193 students currently attending Lake Jipe Primary School. Most of them are in need of pens, pencils, note books, school bags and uniforms. On the side of the school better teaching supports are urgently required, as well as renovation of the classes and construction of further bench desks. 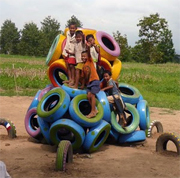 Once the basic requirements are met, we will then turn our attention towards the construction of a few elements to grant the students with their first playground ever. Improving the knowledge of the young generations will hopefully help raise the quality of life of the region and protect its unpaired beauty by developing intelligent projects that fit nicely within the environment. The estimated cost of buying school materials, rehabilitating the classes and building a playground is estimated to US$ 26,000.